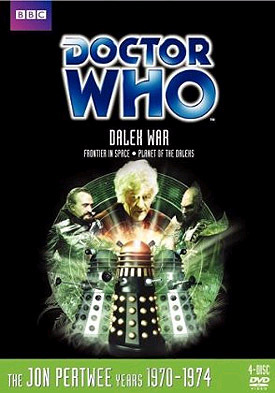 Featuring two six-part Jon Pertwee adventures involving one of the Doctor’s greatest nemeses. Packed with a host of fantastic special features, this four-disc box set contains Frontier in Space and Planet of the Daleks. Injured after a shoot-out between his old nemesis the Master and the Ogrons, slaves to the evil Daleks, the Doctor sends a message to the Time Lords, asking them to pilot his TARDIS and follow the Daleks to their new base. After he slips into a coma, it falls to his assistant Jo Grant to explore the planet where the TARDIS finally materialises. She meets a party of Thals and is left in hiding aboard their crashed spaceship while they go to the Doctor's aid. On his recovery, the Doctor learns of their mission to destroy a party of Daleks sent here to discover the native Spiridons' secret of invisibility. Not only must the Doctor contend with the Daleks' new scheme, but he must try to stop them unleashing a plague that will exterminate all organic life. When a rescue ship of Thals arrive, they bring with them darker news still - somewhere on Spiridon 12,000 Daleks are waiting to emerge and take what they believe is their rightful place as the Universe's supreme beings! - Commentary with actor Katy Manning, producer Barry Letts and script editor Terrance Dicks, moderated by Clayton Hickman. - Perfect Scenario: Lost Frontier (dur. 30' 04") - A new two-part feature from 'What Lies Beneath' producer Steve Broster and writer David Harley. In the far future, the remaining population of an oxygen-depleted planet Earth lies in enforced stasis in The Field of Dreams, their minds kept active through the work of scenariosmiths. Looking for ideas to help him re-connect to his captive audience, Zed, a young scenariosmith, turns to the world of Doctor Who for inspiration… Featuring interviews with actors Katy Manning, Janet Fielding, Vera Fusek and Michael Hawkins, producer Barry Letts, script editor Terrance Dicks, visual effects designers John Friedlander and Mat Irvine. With Rich Batsford, Mick Broster, Tony Broster, Henry Dunn and Paul Ewing, and the voices of Steve Broster, David Harley and Cathryn Miller. Written by David Harley. - The Space War (dur. 17' 57") - cast and crew look back at the making of the story. Featuring actors Katy Manning, Vera Fusek and Michael Hawkins, visual effects designers John Friedlander and Mat Irvine. Produced by Steve Broster. - Roger Delgado: The Master (dur. 32' 35") - a biography of actor Roger Delgado, most famous for playing the Doctor's arch-nemesis The Master from his introduction in 1971 until his tragic death two years later. Featuring previously unseen photographs, rare excerpts from his many BBC TV appearances and interviews with those who knew and loved him. With his wife, Kismet Marlowe, producer Barry Letts, script editor Terrance Dicks, director Christopher Barry, actors Katy Manning, Linda Thorson, Harry Towb, Frazer Hines, William Gaunt and Damaris Hayman, stunt coordinator Derek Ware. Narrated by Stephen Greif. Produced by John Kelly. - Stripped for Action: The Third Doctor (dur. 16' 05") - the ongoing series looking at the Doctor's comic book adventures reaches his third incarnation. With former Doctor Who Magazine editors Gary Russell and Alan Barnes, comic historians John Ainsworth and Jeremy Bentham, author Paul Scoones. - Commentary wth actors Katy Manning, Prentis Hancock and Tim Preece, producer Barry Letts and script editor Terrance Dicks. - Perfect Scenario: The End of Dreams (dur. 30' 04") - Continuing his search for inspiration, scenariosmith Zed resumes his studies of twentieth century television's Doctor Who. What he finds will have a profound effect on the lives of all of the remaining sleepers in The Field of Dreams… Featuring interviews with actors Katy Manning, Jane How, Janet Fielding, Bernard Horsfall and Tim Preece, producer Barry Letts, script editor Terrance Dicks. With Rich Batsford, Mick Broster, Tony Broster and Paul Ewing, and the voices of Steve Broster, David Harley and Cathryn Miller. Written by David Harley. - The Rumble in the Jungle (dur. 16' 46") - cast and crew look back at the making of the story. Featuring actors Katy Manning, Jane How, Bernard Horsfall and Tim Preece, director David Maloney and designer John Hurst. Produced by Steve Broster. - Multi-colourisation (dur. 10' 47") - a look at the colour restoration of episode three. With producer Barry Letts, Colour Recovery Working Group leader James Insell, 2entertain commissioning editor Dan Hall and colourist Jonathan Wood. Narrated by Glen Allen. Produced by Ed Stradling. - Stripped for Action: The Daleks (dur. 13' 54") - the ongoing series looking at the Doctor's comic book adventures focuses on his deadliest foes - the Daleks! With TV producer Gerry Anderson, former Doctor Who Magazine editors Alan Barnes and Clayton Hickman, comic historian Jeremy Bentham and author Paul Scoones. - Blue Peter (dur. 12' 34") - two items from the childrens' magazine program, featuring an appeal for any information on the theft of two Daleks from the BBC and their subsequent return.